Want to make potato salad just like your mom used to? 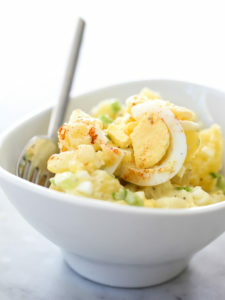 Our original recipe for potato salad is so great ! Put potatoes to good use with this classic potato salad — a perfect accompaniment to any main meal. A must for picnics! This classic potato salad takes only 10 minutes of hands-on prep time. Now, let’s know about the directions of this recipe. The Directions to make this recipe is given below. At first in salted water boil peeled potatoes until done. Cool to room temperature. In large bowl place diced potatoes. Mix mayonnaise, sugar, cider vinegar, mustard, garlic powder, salt, and pepper in another bowl. Add onions and celery and mix well. That’s it ! you are done. Now you have the most Classic Potato Salad. Enjoy.